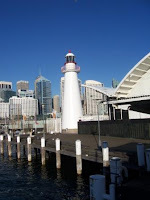 We had a busy time in Sydney but here are just a few glimpses. 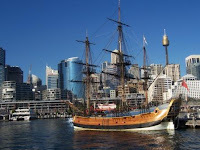 Most of these were taken from the ferries - love those ferries in Sydney. They were punctual and so easy to get on and off. We still managed to miss a couple of them though - too busy chit chatting. 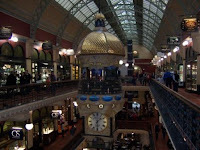 The Sydney quilt show was good. There were some outstanding quilts and the sales stalls were very tempting. I didn't spend too much - very controlled really. The stand out at the show was the Japanese textile display. The silk thread on silk fabric embroidery was out of this world and the wearable textiles were very interesting. No photography was allowed and any description I could give you of the work would not be able to describe just how beautiful it all was. Ruby the wonder dog. 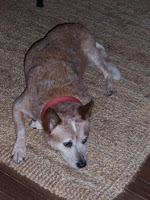 Ruby lives at Avalon in Sydney and she is a very intelligent lovable red cattle dog who thinks she is human. Ruby rules the roost. 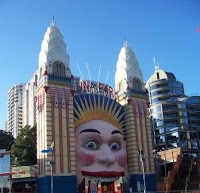 Sydney's a great place for a break - sounds like you had a great time! Evolution of "The Brown Thang"